On 8 March 1927 Huff-Daland Airplanes Inc became the Keystone Aircraft Corporation. Keystone bombers formed the backbone of the USAAC's heavy offensive force for nearly a decade. Although the first aircraft of the series was delivered in 1927, they were still being produced in large numbers in the early 1930s. Indeed during 1931 and early 1932 Keystone delivered more than 100 bombardment biplanes to the USAAC. In the following year Keystone maintained bomber production, supplemented by amphibians and patrol flying-boats for the US Navy. As a replacement for the Martin NBS-1 biplane bombers, Keystone delivered in August 1927 nine LB-1s, each powered by a single 760hp Packard 2A-2540 engine. Known to Keystone as the Cyclops, the LB-1 was a development of the XLB-1 Pegasus prototype powered by a 800hp Packard 1A-2540 engine. 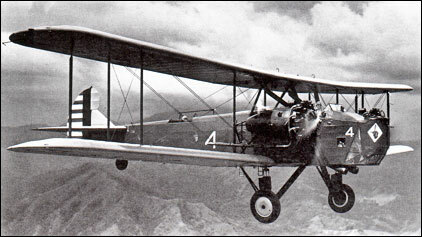 With a change of USAAC policy from single-engined to twin-engined bombers, Keystone delivered the original XLB-5 Pirate. This decision was no doubt influenced by the successful flight testing of the XLB-5 Pirate which in 1926 had proved capable of maintaining altitude for half an hour on one engine only, and it had 'the ideal' bombing fuselage, developed by Air Corps engineers. This was followed by ten Liberty-powered LB-5s and one XLB-3, the latter with a triple fin and rudder tail unit. Twenty-four 420hp Liberty-powered LB-5As were then produced, each with twin fins and rudders, plus one 525hp Wright R-1750-1 Cyclone-engined XLB-6. Production continued with 17 Cyclone-powered LB-6 and 18 525hp Pratt & Whitney R-1690-3 Hornet-powered LB-7 Panthers. Experimental installation of different engines in LB-6s and LB-7s led to a number of one-off types, including the LB-9, LB-10, LB-11 and LB-12. However series production began again with 36 B-3As, featuring a lengthened fuselage and a conventional single fin and rudder tail unit. Power for the B-3As was provided by Hornet engines similar to those fitted to the LB-6, as also powered five service-test Y1B-4s. Twenty-seven B-5As and six Y1B-6s, with 525hp Cyclones, followed 25 575hp Hornet-powered B-4As. Finally came 39 575hp Wright R-1820-1 Cyclone-powered B-6As, making a grand total of well over 200 bombers built in the series. Although generally similar to earlier versions, it is worth remarking on the accommodation for the B-6A. A crew of five was carried with a gunner's and bomber's cockpit in the nose fitted with a gun-mounting above and a bomb-sighting and -dropping compartment below. Pilots' cockpit, with accommodation for two side-by-side, was in front of the wings. Under the centre-section was carried the standard Air Corps internal bomb rack for 975kg of bombs. Midway between the wings and the tail was the aft gunner's position armed with twin Lewis guns above and one Lewis gun below; with the wireless operator's compartment in the fuselage. Of the Keystone bomber force, only 120 aircraft served in the USA, the rest being deployed in Hawaii, the Philippines and around the Panama Canal. Interestingly a number of the bombers took part in the National Air Races and also performed occasionally as makeshift mail carriers. I am fairly shure that a B-4 flew over my home in High Springs, Fla. at an altitude of about 600 feet in about 1931. If not it was a very simular aircraft. As a child of nine I was so impressed by what I had seen that I told my mother one day I to wanted to be up there. I later was as a B-25 and B-24 Pilot. I believe it was in the book, "I Wanted Wings" where the writer and former pilot of the keystone told how to make spot landings with one. "Cut a five insh hole in the cockpit floor. Mount a section of stovepipe vertical over the hole. Sight downward thru the stovepipe and when over the spot, cut both engines. You should land a few feet short." If anyone's interested, I wrote a story, 'The Keystone' about a Keystone bomber in the Philippines just before Pearl Harbor. Will send copy, gratis. I have a letter from a pilot of a bomber out of Langley, Va. flying to New York in 1927 or 1928 (Lake Saranac? )at night and nearly freezing going over the Appalachians etc. This letter and 40 some other letters from this pilot were written to my aunt at Farmville Teachers College, Va. They were engaged to marry but never did. Bill G.